By Kathy Ruhf, Senior Program Director; and Cris Coffin, Policy Director, Land For Good. State-level networking across the region is advancing programs and policies. Agricultural service providers are working together to provide land access education and outreach programs and opportunities, and to promote supportive state policies. From across the region, a group of 50 farmland protection and land access practitioners and Natural Resources Conservation Service (NRCS) staff gathered in NH in November to explore common challenges and conditions in state Purchase of Agricultural Conservation Easement (PACE) programs and related tools promoting affordability and access. These include buy-protect-sell projects and options to purchase at agricultural value (OPAVs). Hosted by Land For Good and American Farmland Trust, the event enabled participants to discuss ways USDA’s Regional Conservation Partnership Program (RCPP) can be used for farmland protection. They learned more about AFT’s new mapping and data initiative, Farms Under Threat: State of America’s Farmland, and were briefed on latest state and federal policy developments. We will continue this regional networking in 2018, including the release of a state land access policy compendium this spring. Jim Hafner, Executive Director of Land For Good, with Erica Buswell, Vice President of Programs of Maine Farmland Trust. 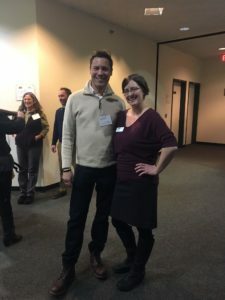 At the state-level, beginning farmers in Maine had an opportunity to roll up their sleeves to design and write a farm lease as part of a two-day conference hosted the state’s Beginning Farmer Resource Network. The conference was held in conjunction with the State of Maine Agricultural Trades Show in January. The Maine Farmland Access Conference co-sponsored by Maine Farmland Trust and Land For Good in December tackled challenges for providing for a farm’s future when a farmer is ready to retire, and how next generation farmers can take on the stewardship of farmland in transition and shepherd the future of Maine’s food system. In Massachusetts, a well-attended breakout session on land access at the November forum of the Massachusetts Food System Collaborative highlighted the work that many land trusts, community groups, and farm organizations are doing to promote land access for new and limited resource farmers. Participants expressed interest in fostering greater collaboration between urban-based and rural-focused efforts. The Collaborative plans to convene a work group this spring to further this discussion, and to provide input to the Department of Agricultural Resources on opportunities and need for additional state programming and resources. Also in Massachusetts, we welcome a new Field Agent to Land For Good. Jason Silverman, our new Massachusetts Field Agent has had a lifelong passion for agriculture, particularly forage production and equipment operation. He owns and operates Windrow Farm in his hometown of Conway MA, producing hay and focusing on grass-based farming systems. A UMass Amherst graduate, he was the farm manager of the UMass Student Farm and has a strong commitment to agricultural education. We were thrilled to bring Jason on this past summer, freeing up Kathy Ruhf for other tasks. As a first-generation farmer, Jason has witnessed the struggles of land access and farm succession firsthand. As a Field Agent, Jason provides direct assistance to farm seekers, landowners and transitioning farm families. 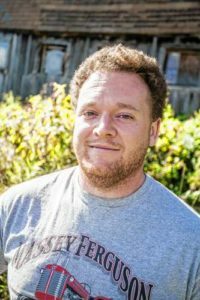 He also brings his techie inclinations to administering New England Farmland Finder and the Farm Transfer Network of New England, two websites developed with support from LAP funds. A statewide group in Connecticut, the Farmland Access Working Group (FLAWG), has focused on the need to expand the property listings on Connecticut FarmLink and is pursuing funding to develop outreach materials and provide technical assistance to landowners to grow the listings. FLAWG is also pursuing a change in the cost-share requirements for the state’s Farmland Restoration Program to enable beginning farmers to make greater use of this innovative program. LFG’s Connecticut Field Agent, Rachel Murray, left her position with LFG to work full-time with Baystate Certifiers – a great opportunity for Rachel. Until LFG posts the position, Connecticut farmers, landowners and community members can contact Kathy Ruhf. Our southern New England Field Agents will happily step up. And a Rhode Island Land Access Work Group collaborated on a statewide mailing to landowners as well as on comments to the RI Department of Environmental Management on new state solar siting regulations this past fall. In January, several of the work group’s members also participated in a workshop organized by the Southside Community Land Trust focused on best practices for providing technical assistance and workshops for people with limited English proficiency.